Tasting Notes: It is complex and long in the mouth. Its flavour profile includes sugar, caramel, cocoa and cinnamon. Brandy Oolong is made from a special cultivar of the tea plant unique to Taiwan (TTES 18), this offering is a highly oxidized (85-90%) oolong tea that has only recently been introduced to western tea enthusiasts. Also known as “Ruby-18″, this style of oolong was initially created by crossing the Assamica tea varietal with the native tea plant to produce a tea that has become the favourite for tea enthusiasts of every age. When brewed, it has a rich caramel colour similar to a fine aged brandy. Brandy Oolong’s rich and amber brew hints of spice, cinnamon and caramel malt notes. It is wonderfully smooth and complex, without any bitterness and has an excellent sweet finish! 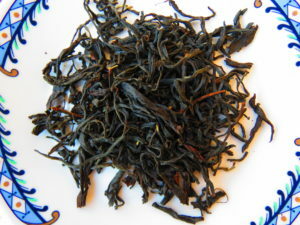 Our Brandy Oolong, Ruby-18 has quickly become one of our favourites and will become one of yours as well!